It's Wanderlust Wednesday! 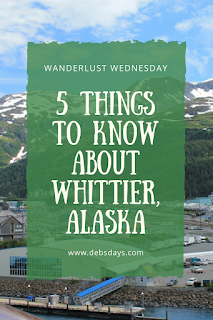 Today we're talking about Whittier, Alaska. 1. 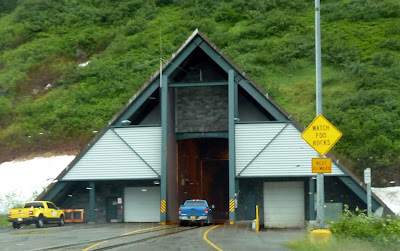 The only way to drive to Whittier, Alaska is by car ferry or by driving through an old converted World War II railroad tunnel, the Anton Anderson Memorial Tunnel. It's both the longest highway tunnel in North America at two and a half miles. It's also the longest combined railroad/highway tunnel in North America. What does that mean? If you drive the tunnel, you will be driving on the railroad tracks. Here is the entrance to the tunnel in Whittier. Looks like that truck is driving on top of the railroad tracks, right? Now look at the picture I took when I was in the tunnel. Yep, those are railroad tracks and I'm driving right over them. Everyone has to come through the tunnel at Whittier. All cars, coaches, and even the trains share the one lane, one way road. It opens for traffic heading out of Whittier on the hour and to Whittier on the half hour. I've driven it several times and it's always scary to me. 2. Everyone in Whittier lives in the same building. See that building to the right, under the arrow? That's Begich Towers. The Begich Towers house the residents of Whittier. It also houses the post office, store, gym, church, and meeting rooms, all in that building. The school is even attached, accessed through an underground tunnel. 3. There is one car rental location in town. It is a convenience store/bait shop/hardware store/harbor store/car rental counter all rolled into one. Yep, it's just as crazy looking inside as it is outside. 4. 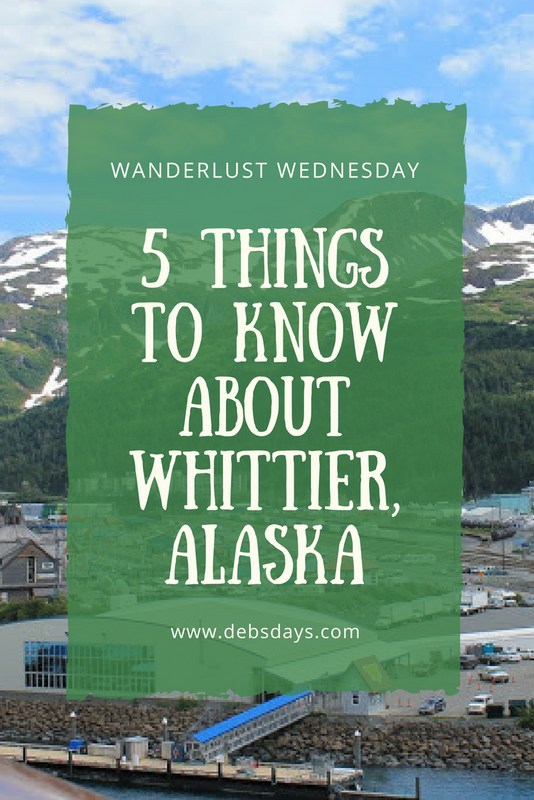 Whittier gets an average of more than 20 feet of snow a year. Yikes. Most of the time we've been there it has been wet and cold. But we've missed their winters, thank goodness! 5. Princess Cruises uses Whittier as their northernmost Alaskan port for disembarkation. Passengers then head to Anchorage, Fairbanks, Denali, and all other interior destinations. There are only a couple hotels in Whittier and they fill up fast when the cruise ship is in town. 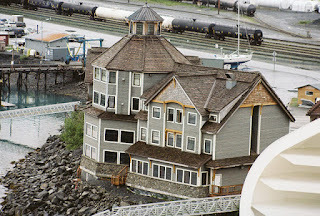 In 2002 I took a picture when we were in Whittier of something that looked like a hotel. Here's that picture from 16 years ago. On all of our subsequent trips to Whittier I've looked at that building and wondered about it. Wondered if it was a hotel or bed and breakfast or somebody's home. 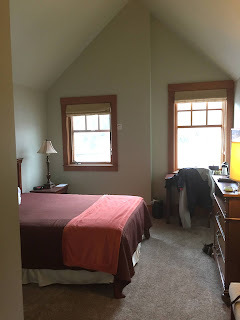 Well, it's a hotel - the Inn at Whittier - and we've officially stayed there. If you still want to know more about Whittier, CNN did a nice little overview of the town a couple years back. 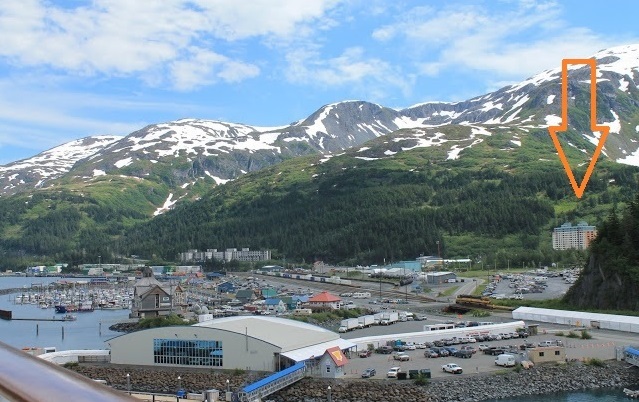 Read and watch Northern Enclosure: Alaska's One-House Town, Home to Hundreds here.